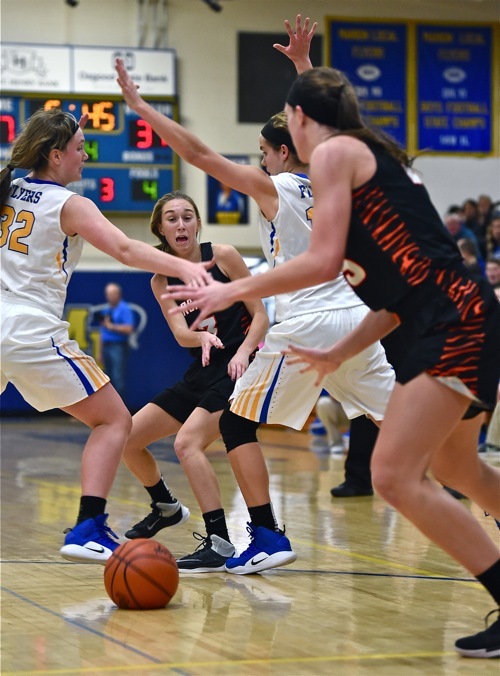 In a hard-fought defensive battle, Versailles remained unbeaten in a now familiar manner…they topped a gritty Marion Local team in overtime – their third overtime win in seven outings. Maria Stein – It was exhausting to watch – the amount of energy, some skinned elbows and knees, and at times…utter frustration on the part of both teams to score. It was, to watch, a war of wills for the first twenty eight minutes. But after thirty six minutes of rock ’em, sock ’em basketball Thursday, Versailles (7-0) escaped the usually not-to-friendly confines of the the gym they call ‘The Hangar’ with a 56-47 win, in overtime – the Tigers’ third OT win in seven outings. It was the kind of game you might see in February, so focused were the two teams on making each possession as tough as possible – like a mine field of switching defenses and constant pressure from all points of the court. 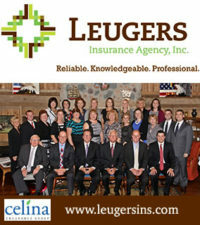 Leugers is proud to sponsor coverage of MAC sports on Press Pros. 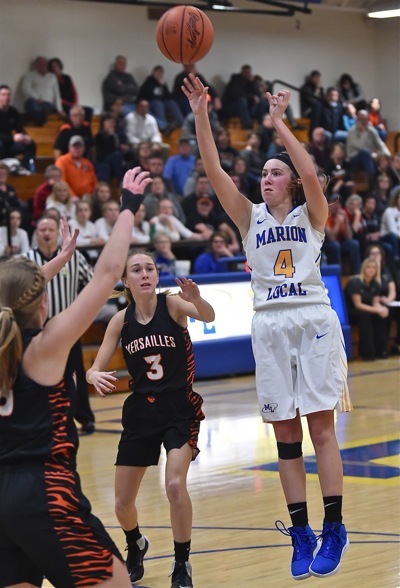 It was a game that saw Marion shoot the ball well early, while Versailles did not, opening a quick 12-4 lead in the first quarter…only to see Versailles battle back to cut the deficit to 27-23 with points off late turnovers before the half. It was a game that saw Marion come out in the third quarter and open their biggest lead of the game, 33-23, and the Flyers seemingly had their foot on the throats of last year’s state runners-up. But they could not put them away. They got the grit they sought, outscoring Marion 19-9 over the last twelve minutes of regulation play – creating more turnovers, then scoring off those turnovers – the constant pressure seeming to wear down Marion physically, and emotionally. Versailles’ Liz Watren threads the needle with a pass between Marion defenders to teammate Lindsey Winner. Still, Versailles trailed by three points with twenty five seconds remaining, when perhaps the costliest turnover of the game for Marion (a ball lost out of bounds in front of the Marion bench) gave the Tigers the ball back with time to set up in their half-court offense. They reversed the ball from side to side a couple of times before Danielle Kunk found point guard Caitlin McEldowney open on the wing, a step behind the three-point line. McEldowney caught the ball, squared herself to the basket, and without hesitation launched the biggest of her four made field goals of the game – and her only three-pointer. It tied the score at 42-42, but it left eighteen seconds on the clock, enough time for Marion to retake the lead on their end. But the Flyers turned the ball over again before they could score, giving Versailles yet another opportunity to score with six seconds remaining. They couldn’t…and the game went into overtime. Overtime has been good to Stonebraker and the Tigers this year, having won twice previously on their opening weekend over Chaminade-Julienne and Tri-Village. And it proved to be a charm for the third time, as well. Marion would get the first basket of the extra period on a low post shot from Brooke Homan…but Versailles quickly scored at their end to tie the game at 44-44, and then moments later after a missed shot by Marion junior Brooke Stonebraker gave the Tigers their FIRST lead of the game on a running hook shot from the lane, 46-44. Marion’s Kelsey Koenig cans a foul line jump shot for two of her five points in the game. 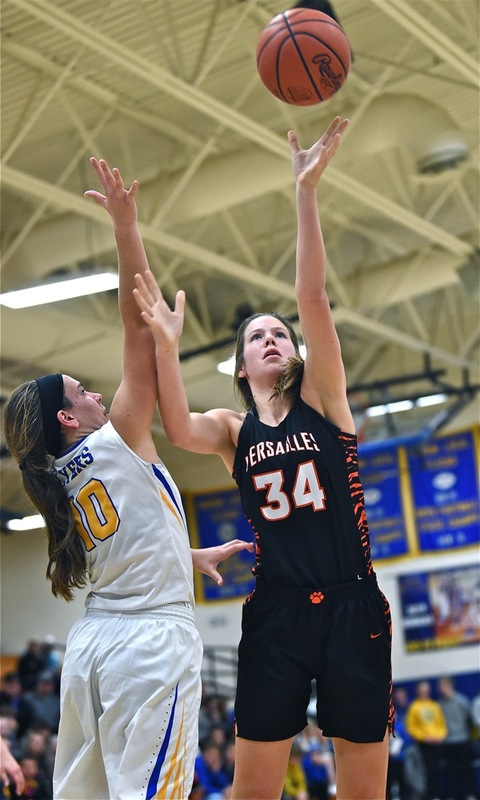 On the ensuing out-of-bounds pass teammate Danielle Kunk stole the ball and in one motion laid it up and in to give Versailles a four-point lead and all the momentum they would need…to finish. They went on a 12-2 run before Marion’s Natalie Rethman finally canned a three-pointer from the corner for Marion’s final points. 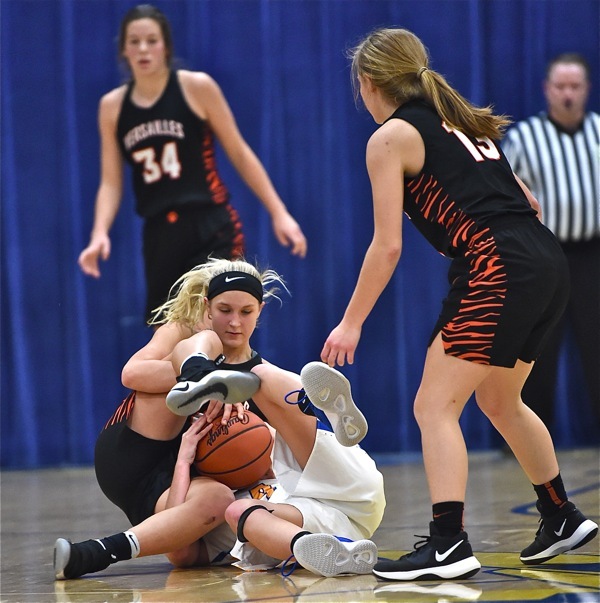 Forced to foul, Marion sent McEldowney to the line for Versailles and the diminutive Tigers’ guard more than sealed the game by making four of five in the closing seconds. Versailles won it with three players reaching the double-figures column in scoring. McEldowney led all scorers with a game-high 17 points, while Stonebraker had 12 and Danielle Kunk finished with a flourish…with 10. 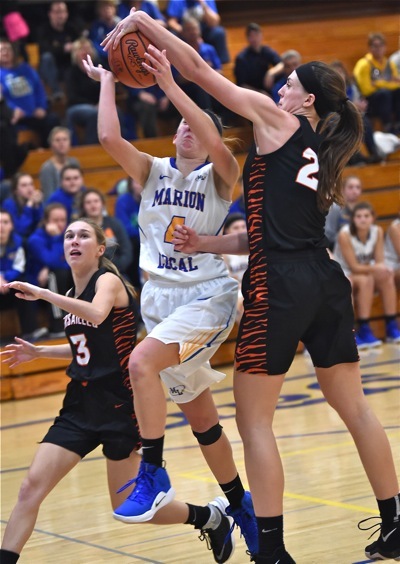 Marion dropped to 3-2 on the year with a pair of players in double figures – Heidi Rethman with 15 and Brooke Homan with 10. But it wasn’t easy, regardless of the outcome, like one of those tension-packed games in February when every possession is valued and every bucket is akin to a winning 5-buck pull-off. And when they got to that point three players in the final stage of things stepped up to seize the moment – Caitlin McEldowney, Brooke Stonebraker, and Daniell Kunk. Defense at both ends…but Versailles tightened down to outscore Marion 19-9 in the last twelve minutes of regulation. As it turned out, the BIG shot came from the littlest player on the court. And finally, it’s likely that neither team shot 40% from the floor. But some nights the rim does seem to shrink, and when it does you have to find another route to win…a route, in this case, that both Stonebraker and Marion coach Beth Streib are accustomed because both stress tough, pressure defense. In basketball they call it…overtime! Versailles’ Danielle Kunk wrestles the ball away from a Marion player during the Tigers’ fourth quarter comeback. Moeller Trucking is proud to sponsor coverage of “The MAC” on Press Pros Magazine.com.